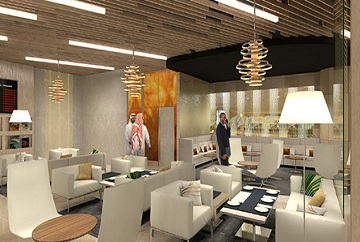 Walk into our luxurious lounges, designedsetting your peace of mind as our highest goal. . Every aspect of our upcoming lounge in the Kingdom is crafted to perfection. Whether you are traveling for business, leisure or simply to enjoy some time off with the family, our state-of-the-art facilities will help you relax, refresh and be ready to fly. We will be designing our Dammam lounge to envelope you in a world of luxury, where it captures the essence of modern Arabian hospitality. Feel at home in this 1200 Sq. ft. state-of-the-art lounge, built around your needs for comfort and utmost privacy. The finest amenities including free Wi-Fi, tastefully selected refreshments and highly personalised services make this stopover a travellers’ sanctuary.